The Dufferin/Wilson Regeneration Area Study will establish ‘tailor-made’ strategies and a planning framework for development in the study area, implemented through site and area specific policies. The Regeneration Areas designation provides for a broad mix of uses, which can include residential, institutional, commercial, light industrial, parks and open spaces. Regeneration Areas are key to the Official Plan’s growth strategy to reintegrate areas of the City that are no longer productive due to shifts in the local or global economies. 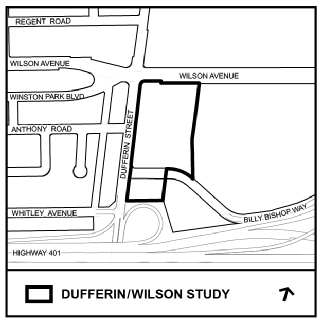 The Dufferin/Wilson Regeneration Area Study was initiated because as a result of the City’s Five Year Review of the Official Plan and Municipal Comprehensive Review. At its meeting held on November 21st, 2013, the Planning and Growth Management Committee adopted a Report from the Chief Planner which outlined proposed City-wide Employment Areas policy directions. Council enacted and passed Official Plan Amendment 231 by By-law No. 1714-2013 on December 18, 2013 with respect to the Economic Health Policies and the Policies, Designations and Mapping for Employment Areas. This Amendment converted the Employment Areas lands in the Dufferin/Wilson area, through re-designation, to Regeneration Areas, and introduced a site and area specific policy to guide future development.